David Horowitz, born in New York in 1939 to left-wing parents, became a prominent member of the New Left in the 1960s, edited the influential radical magazine Ramparts and published (among other things) a trenchant critique of US foreign policy in the Vietnam era:The Free World Colossus: A Critique of American Foreign Policy in the Cold War (1965, 1971). "Horowitz was a confidant of Black Panthers leader Huey P. Newton, and provided legal and financial assistance to the black revolutionary organization. He would later cite experiences with his involvement in the Panthers as the primary catalyst for reassessing his beliefs. In December of 1974, his close friend Betty Van Patter, a bookkeeper for the Panthers, was murdered. While the case officially went unsolved, Horowitz has maintained that the Panthers were responsible for her murder, committed in order to silence Patter from revealing the organization's financial corruption, and [that they] thereafter covered up the killing." By the 1990s his activism had begun to focus on critiquing what he considered a "left-wing bias" at many US universities. In this context he began pushing for what its supporters call an "Academic Bill of Rights," a call for hiring more professors who would push a right-wing agenda. The vilification of left-wing professors in The Professors is part of this agenda. Horowitz's claim (below) that Herbert's essay coining the term Repressive Tolerance (full essay) is a "justification for the suppression of conservative speech" twists Herbert's argument 180 degrees. This essay actually points out that a rhetoric of "tolerance"--equal opportunity for speech--is a farce in the face of unequal power and access to the media that make that speech audible. By masking the fact that the speech of the oppressed is inaudible, the rhetoric of tolerance conserves existing inequalities. Marcuse does not ultimately call for the suppression of conservative speech, he merely (!) exposes how "tolerance" is a rhetorical device used by the powerful to repress the speech of those without access to institutional and inherited power. The institutionalized professors criticized by Horowitz draw his ire for acting as spokespersons for the oppressed, while Horowitz attempts to argue--unsuccessfully, as the exposés in the links below reveal--that they are suppressing the speech of oppressed conservatives. In any case, I think Horowitz's text below makes very clear why many conservatives hate Marcuse's essay on Repressive Tolerance so vehemently: It exposes their clamoring for greater representation as an attempt to conserve the "status quo of inequality and discrimination." Horowitz's The Professors is an attempt to intimidate and suppress individuals who voice the concerns of those with little or no access to power. "David Horowitz debunks David Horowitz: A Media Matters analysis of The Professors," April 18, 2006 at mediamatters.org: of the 100 professors listed, only six were denigrated by Horowitz solely on the basis of in-class behavior and activities, while 52 were denigrated without any reference whatsoever to in-class activities. "Facts Count: An Analysis of David Horowitz's 'The Professors'," posted May 9, 2006 at freeexchangeoncampus.org (50 page pdf). 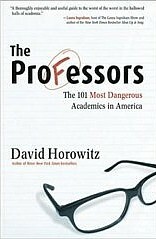 InsideHigherEd.org summarizes: "Quotes and facts from Horowitz about individual professors are incorrect and many quotes are 'wildly out of context.'" June 15, 2006 Point-by-point rebuttal to the Free Exchange article by Jacob Laksin, a senior editor at FrontPageMag.com, a webzine edited by Horowitz and published by the David Horowitz Freedom Center in Los Angeles. [p. xxxv] In a survey of 1,643 faculty members drawn from 183 colleges and universities, the authors concluded that "over the course of fifteen years, self-described liberals grew from a slight plurality to a five to one majority on college faculties, while the ratio of liberals to conservatives in the general population remained relatively constant. Rothman, Lichter, Nevette, "Politics and Professional Advancement Among College Faculty," The Forum, Vol. 3, Iss. 1, Art. 2, 2005 http://www.cmpa.com/documents/ 05.03.29.Forum.Survey.pdf. These statistics are perfectly compatible with the view that the exclusion of conservatives began roughly thirty years ago when a generation of [p. xxxvi] political activists started to acquire power over faculty hiring and promotion committees. Are these disparities the result of political discrimination? There is considerable reason to believe that they are. Certainly the rationale for such an agenda has long been a staple of radical thought. The political activists who flooded university faculties in the early 1970s were encouraged by their own theories to regard the university as an instrument for social change whose levers of power it was important for "progressives" to manipulate and control. Academic radicals self-consciously drew their social strategies from the writings of the Italian Communist Antonio Gramsci, around whom an academic cult formed in the 1970s, just as they were ascending the tenure ladder. Gramsci was an innovator in Marxist theory, whose ideas focused on the importance of acquiring cultural "hegemony" as the fulcrum of revolutionary change. Gramsci explicitly urged radicals to gain control of the "means of cultural production" to further their ends. Foremost among these means were the universities and the media. On the importance of these committees see Chapter 4: The Representative Nature of the Professors Profiled in this Volume, below. The considerations that led Gramsci to these conclusions would certainly have also encouraged faculty activists to seek institutional power within the university by acquiring control of its hiring and tenure committees. The same argument would also justify the exclusion of conservative texts from academic reading lists, which is an all too common practice on liberal arts campuses. Today senior conservative professors (and most conservative professors are now senior) find themselves regularly excluded from search and hiring committees, and a dwindling presence on university faculties. A typical case was reported to a visitor to the University of Delaware in November 2001, who asked a senior member of the history department, and its lone conservative, how a system worked that had made him such a solitary figure. The professor answered, "Well, they haven't allowed me to sit on a search committee since 1985. In that year I was its chair and we hired a Marxist. This year  we had an opening for a scholar of Asian history. We had several candidates among whom the best qualified was from Stanford. Yet he didn't get the job. So I went to the chair of the search committee and [p. xxxviii] asked him what had happened. 'Oh,' he said, 'you're absolutely right. He was far and away the most qualified candidate and we had a terrific interview about his area of expertise. But then we went to lunch and he let out that he was for school vouchers. And that killed it." This and the following anecdote were related to the author personally. Apparently, a politically incorrect view on K-12 school voucher proposals implied incorrect views about the Ming Dynasty or the Meiji Restoration, disqualifying the bearer for academic employment. Or perhaps the radical faculty in the history department did not want to hire a loose cannon who might eventually jeopardize their control. The bitterly intolerant attitude of the current academic culture towards conservatives is inevitably a factor in the exclusion process. In the spring of 2005, the Skidmore College News published an article called "Politics in the Classroom," which quoted anthropology professor Gerry Erchak to this effect: "In the hiring process you'd probably be wise not to mention your political views. If you say, 'Oh, hey, I really think Reagan was great,' or, 'I'm a Bush guy,' I can't say a person wouldn't be hired, but it's like your pants falling down. It's just horrible. It's like you cut a big fart. I just don't think you'll be called back." "Politics in the Classroom," The Skidmore News, April 29, 2005. Professor Shortell is profiled in this volume. Faculty prejudices reflected in Erchak's comment are a pervasive fact of academic life. In the same spring, Professor Timothy Shortell  was elected by his peers to the chair of the sociology department at Brooklyn College. His election became a news item when it was discovered that he had written an article referring to religious people as "moral retards" and was on record describing senior members of the Bush administration as "Nazis." The recent eruption of the Churchill controversy had made Shortell's extreme attitudes newsworthy, but apparently had not impressed his department peers as the least bit unusual when they elected him. As in the case of Ward Churchill, the public airing of Shortell's prejudices generated a reaction strong enough to persuade [p. xxxix] the president of Brooklyn College to block his appointment to the departmental chair and avoid further embarrassment to the college. But left to itself, the university process would have placed Shortell in a position to determine the composition of faculty for a generation to come. Departmental chairs at Brooklyn College exercise veto powers over faculty hiring decisions. Is it reasonable to think that someone with views like Shortell's would approve the hiring of a sociology candidate with religious views or Republican leanings? According to the survey of seventeen hundred academics by Professor Daniel Klein and Andrew Western, the ratio of Democrats to Republicans in sociology departments nationwide is 28-1. Daniel Klein and Andrew Western, "How Many Democrats per Republican at U.C. Berkeley and Stanford?," "Surveys on Political Diversity in American Higher Education" http://www.studentsfor aca- demic freedom.org/reports/Surveys.html. Mike Adams, "Fear and loathing in faculty recruitment," Townhall.com, June 2, 2004. Criminology professor Michael Adams of the University of North Carolina, Wilmington, has reported an incident reflecting similar prejudice. A colleague on a search committee for the Criminology Department remarked to him that a candidate they were reviewing should not be hired because he was "too religious." Too religious to study crime? Among his search committee colleagues, only Adams thought this peculiar. The prejudice against conservatives is so ingrained and commonplace that academics do not see it as a problem at all. To them it is just the order of things. When an anthropology professor at Rollins University, an elite private school in Florida, was asked whether he was concerned that there were no conservatives in his department, he explained: "Anthropology is the study of other cultures and requires individuals who are compassionate and tolerant." The anthropology professor is Robert Moore and the question was asked by the author of this book on a visit to Rollins. Even when it was brought to his attention, the professor was completely oblivious to the intolerance of his own statement. Recipient of the Lenin "Peace Prize"
 Hallinan was formerly an editor of the Communist Party newspaper, The People's World. Conn Hallinan who is Provost at Santa Cruz  and Professor Harry Targ, chair of the "Peace Studies" program at Purdue. The interviewer was David Horowitz, who was doing background research for the portrait of Newton in Destructive Generation, 1989. "to demonstrate that PhD is a fraud." In this endeavor, he was only half successful, since the program is still going forward. [p. 116] Born into a middle-class family in Birmingham, Alabama in 1944, Davis attended segregated elementary schools in that city until she was selected for a special life of radical privilege, going to live with Communist Party leader Herbert Aptheker's family in New York and attending the Little Red Schoolhouse and Elizabeth Irwin High, both institutions of the Communist left. Angela Yvonne Davis biography, marcuse.org. In September 1969, Professor Davis was fired from UCLA when her membership in the Communist Party became known. This resulted in a celebrated First Amendment battle that made Angela Davis a national figure and forced UCLA to rehire her. In 1970, Professor Davis was implicated by more than 20 witnesses in a plot to free her imprisoned lover, fellow Black Panther George Jackson who was awaiting trial on a murder charge. The plot involved hijacking a Marin County, California courtroom and taking the judge, the prosecuting assistant district attorney, and two jurors hostage. Professor Davis supplied a group headed by Jackson's younger brother with a small arsenal of weapons she had purchased two weeks earlier. In an ensuing gun battle outside the court building, Judge Harold Haley's head was blown off by a sawed-off shotgun owned by Professor Davis. Three other people were killed. To avoid arrest Professor Davis fled California, where she used aliases and changed her appearance to avoid detection. Two months later the FBI apprehended her in New York City. Lawrence Cott, "San Rafael Shootout: The Facts Behind the Angela Davis Case," Human Events, June 17, 1972. Gwyneth E. Hambley, "The Image of the Jury in Popular Culture," Legal Reference Services Quarterly, The University of Texas at Austin--Tarlton Law Library, Volume 12, Number 2/3, 1992 http://tarlton.law.utexas.edu/lpop/etext/hambley.htm. saying that prosecutors had been mistaken to expect that the "middle-class jury" would convict Professor Davis. Along with most of the jurors he then went off to a victory party for the defendant. There's a certain woman here named Angela Davis. I don't know if you are familiar with her in this country but in our country, literally, for an entire year, we heard of nothing at all except Angela Davis. There was only Angela Davis in the whole world and she was suffering. We had our ears stuffed with Angela Davis. Little children in school were told to sign petitions in defense of Angela Davis. Little boys and girls, eight and nine years old, were asked to do this. She was set free, as [p. 118] you know. Although she didn't have too difficult a time in [America's] jails, she came to recuperate in Soviet resorts. Some Soviet dissidents--but more important, a group of Czech dissidents--addressed an appeal to her: "Comrade Davis, you were in prison. You know how unpleasant it is to sit in prison, especially when you consider yourself innocent. You have such great authority now. Could you help our Czech prisoners? Could you stand up for those people in Czechoslovakia who are being persecuted by the state?" Angela Davis answered: "They deserve what they get. Let them remain in prison." Aleksandr Solzhenitsyn, Warning to the West, Farrar, Straus and Giroux, New York, 1976, 60-1. In 1979, Professor Davis was awarded the International Lenin Peace Prize (formerly named the International Stalin Peace Prize) by the Soviet police state. Professor Davis ran for vice president of the United States on the Communist Party ticket in 1980 and 1984. Angela Davis is currently a "University Professor," one of only seven in the entire University of California system, which entitles her to a six-figure salary and provides her with a research assistant. This income is supplemented by speaking fees ranging from $10,000 to $20,000 per appearance on college campuses, where she is an icon of radical faculty, administrators, and students, and invariably presented as a "human rights activist." The speaking bureau that represents her describes her as "known internationally for her ongoing work to combat all forms of oppression in the U.S. and abroad." A lounge is named in her honor at the University of Michigan. Beth Potier, "Abolish Prisons, Says Angela Davis," Harvard University Gazette, March 13, 2003.
sequestering people in dreadful places designed to separate them from their communities and their families?'" Pretty difficult, actually. Especially for the victims of such predators. A political apparatchik through and through, Professor Davis has never really made a scholarly contribution or written a serious academic work, despite the expansive university honors she has received. Her political tracts include: If They Come in the Morning: Voices of Resistance (1971) Women, Race, and Class (1981); Violence Against Women and the Ongoing Challenge to Racism (1992); Resisting State Violence: Radicalism, Gender, and Race in US. Culture (1996); Global Critical Race Feminism: An International Reader (1999); Are Prisons Obsolete? (2003). Yet she is a "University Professor"--a very prestigious post in the California system, normally awarded on the basis of extraordinary contributions to scholarship.